Lloyd Jones’ beams confidence, motivation and a desire to learn. Securing a position at the Pizza Hut in China Grove has instilled a new-found conviction in the 26-year-old. Lead Employment Support Professional Tina Moore and Employment Peer Mentor Marcus Berry, who are part of the Behavioral Health Individual Placement and Support (IPS) Employment Services team in Stanly County and have coached Jones since last April, beam just as brightly. The pair enjoys contrasting what Jones was like upon first meeting him last spring and how far he has come today. Jones had been actively seeking employment for over two years with no job prospects. His self-confidence was waning. With Berry and Moore on his side, Jones’ job search took a new direction. “When I got to Tina, she was really motivational and she was kind of a get-up-and-go person. She pushed me to better myself,” Jones remembers. Jones estimates that he has received Monarch services since he was 11 years old with the most recent assistance from the IPS team. IPS helps people we support in search of work while in recovery from a mental health or substance abuse use disorder. When matched, the trio hit the ground running, reviewing how to submit a job application, crafting a resume, practicing interview scenarios and emphasizing the importance of personal follow up with potential employers. Moore and Berry helped Jones accomplish small goals which eventually added up to a win. In August he was hired at the Pizza Hut location near his home. Success didn’t happen without some rejections – and some that hit hard. Moore explains that they helped Jones learn and grow even from the dismissals. “If you genuinely want something and you don’t get it, it probably wasn’t good for you. That is what I took away from not getting a job I applied and interviewed for,” Jones says. Not only did Jones find a job at which he enjoys working but new friendships with staff and management. “I love my job because of two reasons. One, I get to work with food and two, the kind of friendships between the people at work. Work is fun because we tease each other,” Jones says, noting his tasks include making pizza and wings, cleaning and washing dishes. As Jones’ confidence grows, the horizon is looking even brighter as he pursues earning his GED. He is enrolled and taking classes at the northern campus of Rowan Cabarrus Community College, and would like to get his driver’s license and eventually purchase a car. 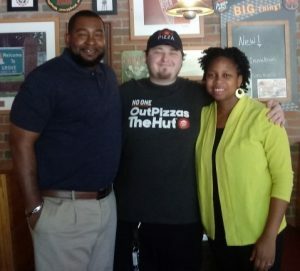 Photo caption: Peer Mentor Marcus Berry, left, and Lead Employment Support Professional Tina Moore, right, visit Lloyd Jones during a recent shift at his new job.